Well folks, this is going to be a big week for Chase. 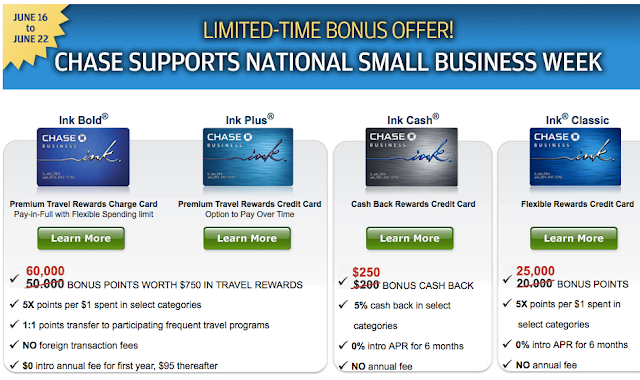 If you haven’t already heard (since it’s already been mentioned on almost every hot deal or frequent flyer blog / forum), Chase has increased the sign-up bonus for the Chase Ink cards for national small business week. From June 16 to June 22, you can now earn an additional 10,000 points for Ink Plus and Ink Bold credit card signups for a total of 60,000 bonus points (after spending $5,000 in 3 months). Chase is also increasing the sign up bonus for the Ink Cash and Ink Classic cards, which are now 25K bonus points instead of the normal 20K bonus points. While these cards have no annual fee I recommend applying for the Ink Bold or Ink Plus to take advantage of the first year free and much larger sign up bonus. You can always downgrade your card into one of the no fee Ink cards later. If you sell things online (ebay, craigslist, etc), you can be considered the sole proprietor of your own business, under your own name. There is no need to use a “legal name of business” if you apply as a sole proprietor. There is also no need for a business tax identification number as you can use your own social security number. You can apply for a business credit card even if you are thinking of opening a business and would like to separate your personal expenses from your future business expenses. 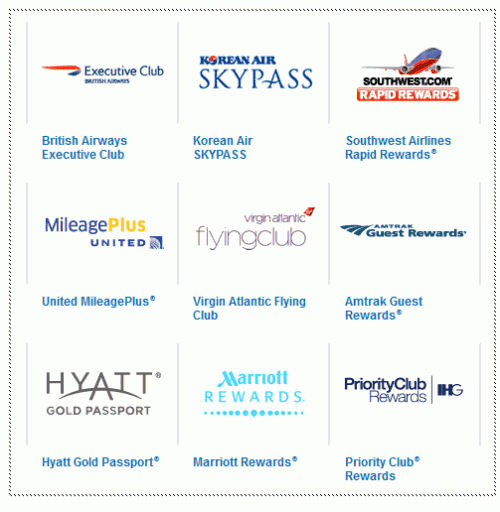 What can you do with 60,000 Ultimate Rewards points? 65,000 United miles is enough for 1 free round trip ticket from the U.S. to Asia. At the very least, you can redeem 60,000 UR points for $600 in cash (which I don't recommend, seeing how you can easily redeem 1 UR point for 2 cents worth with Chase transfer partners. Which Chase Ink card do I apply for? The big difference between the Ink Bold and Ink Plus is that that Ink Bold is a charge card. You don’t carry a balance and you pay the bill in full each month. The Ink Plus card is a credit card, which means that you can carry a balance and be charged interest (which you should never do). Honestly, both the Ink Bold and the Ink Plus should equally suit your needs. I’ve shared before that my Chase Ink Cash card is one of my favorite business credit cards that is always in my wallet. I use it to get 5x points at Office Depot, Staples, and Officemax stores, where I snag gift cards for gas stations, Amazon, Visa debit cards, and more. 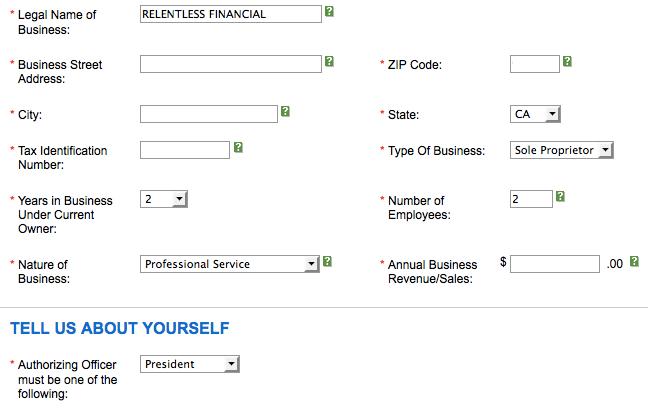 As usual with Chase Business cards, I did not get approved right away. My application is in pending status and requires further review. It’s normal for Chase to take 7 days to 2 weeks to process a business card application, so I’m not too worried. You can check the status of your Chase application at 800-432-3177, hit #, the 2, then 1. You can speak with Chase lending services at 800-453-9717 if you want to speak with a representative who can help approve you of your card. According to flyertalk, Chase is getting slammed right now with applications for the Chase Ink and Chase Plus business credit cards, so it’s best to wait for auto approval. I’ll update this post when I hear from Chase in a few days. I'm keeping my fingers crossed since I've never been declined for a credit card (yet). EDIT: I just called the automated Chase application line (one day later) at 800-432-3177 and found out I was approved for my new Ink card! In the meanwhile, don’t forget to activate your Chase Freedom 5x categories for July 1st to September 30th, 2013 here. 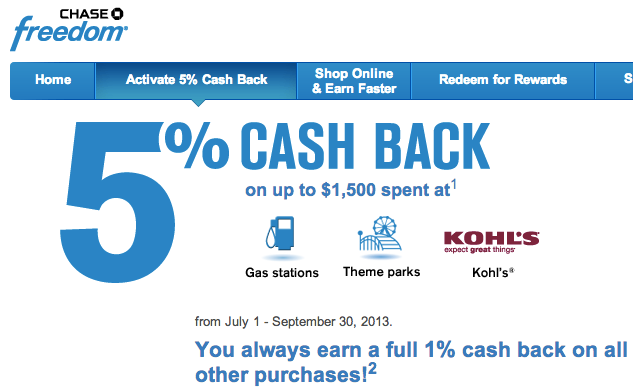 The upcoming 5x categories include Gas Stations, Theme Parks, and Kohl’s. If you don't have a Chase Freedom card yet, you can apply here.